Plectosporium blight, caused by the fungus Plectosporium tabacinum (formerly known as Microdochium tabacinum), is a new,destructive disease of cucurbits in New England. The disease has become endemic to New England. Plectosporium blight is known to cause damage to a wide variety of cucurbit crops in Europe and Asia, but the strain present in the U.S. seems to primarily damage pumpkins, summer squash, zucchini and a few varieties of gourds. In wet years, which favor disease development and spread, crop losses in no-spray and low-spray fields can range from 50 to 100%. Fortunately, this disease is easily recognized and can be effectively managed. Lesions are small (<1/4 inch) and white. On vines, petioles and leaf veins, the lesions tend to be diamond to lens-shaped; on fruit and leaves lesions are usually round (fig. 1, 2 & 3). 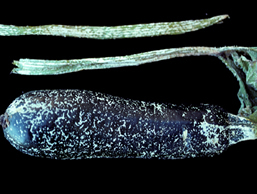 The lesions increase in number and coalesce until most of the vines and leaf petioles turn white and the foliage dies. On fruit, P. tabacinum causes white, tan, or silver russeting which can merge to form a continuous dry, scabby surface. Plectosporium tabacinum is a common fungus in the soil and on decaying plant material and is favored by warm, wet weather. The fungus can overwinter on crop residue and can persist in the soil for several years.The spores are spread by rain-splash and wind. Many strains of the fungus are weakly parasitic. Plectosporium has not been reported to be seed-borne. Tiny, one or two-celled, sickle-shaped spores are formed in lesions on vines, stems, fruit, leaves and leaf petioles. Spores are dispersed by wind over long distances. Severely infected pumpkin vines become brittle and will shatter if stepped on. Early in the infection cycle, foliage tends to collapse in a circular pattern before damage becomes more universal throughout the field. These circular patterns can be easily detected when viewing an infected field from a distance. Numerous fruit lesions produce a white russeting on the surface and stems that render the fruit unmarketable. 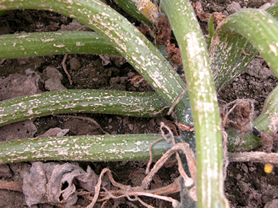 Fruit lesions also allow for entry of soft rot pathogens that hasten the destruction of the crop. 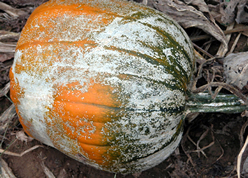 When Plectosporium blight occurs, rotate away from summer squash and pumpkins for two years. Choose sunny, well drained sites for cucurbit production. 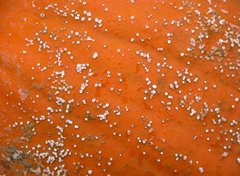 No resistant cultivars of pumpkins have been reported. Scout for disease and apply protectant fungicides when the disease first occurs. The disease is readily controlled by fungicide applications. Thorough coverage of foliage, vines, and fruit is necessary for good control.